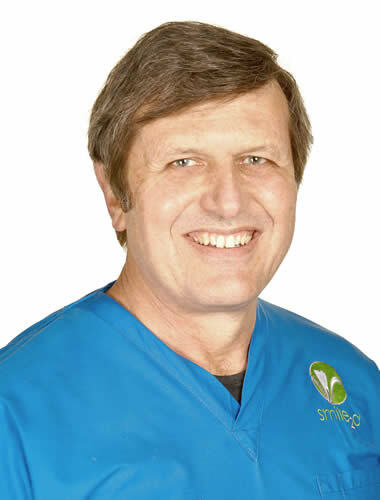 Dr Hennie Van Jaarsveld is a registered specialist Periodontal Surgeon and works closely with the rest of our team to ensure a healthy foundation for restorative, cosmetic or dental implant treatment. He is also able to diagnose and treat general oral diseases (including oral growths and dry-mouth syndrome). Periodontal disease is an inflammatory disease caused by bacterial infection. It is a common infectious disease and left untreated can result in tooth loss. It is the most common cause of tooth loss in modern society, mainly because it is often present without any pain. Bleeding gums, bad oral odour, loose and drifting teeth are all signs of potential underlying periodontal disease. There is increasing scientific evidence that poor oral health, especially the extent and severity of periodontal disease increases the risk of a variety of systemic medical conditions. This includes links to diabetes and coronary heart disease. These associations have been demonstrated and ongoing research continues to investigate the potential benefits arising from improved oral health through healthy gums. Dry Mouth Syndrome, also known as xerostomia, is a dry, uncomfortable feeling in your mouth that results from a decrease in the amount of your saliva. Although sometimes difficult to treat, there are many different approaches that can be considered in managing this condition. Oral cancer is a malignant growth that affects any part of the oral cavity, including the lips, upper or lower jaw, tongue, gums, cheeks or throat. Early diagnosis and treatment of these or any suspected lesions is prudent.